It’s been over a year since the Greek debt drama popped its ugly head in the markets, yet fiscal woes still seem to be haunting the euro zone. News of Ireland’s debt situation and bailout dominated during the latter half of this year, but it looks like another one of the PIIGS nations is getting ready to hog the debt spotlight by 2011. This week, credit rating agency Moody’s warned Spain that its debt rating is under review and could suffer a downgrade soon. Contagion fears, high funding needs, and banking sector problems are just a few of the reasons why Spain’s Aa1 rating is in trouble. In the latest Spanish bond auctions, investors required much higher yields on 10-year and 30-year bonds. This means that lenders asked for higher rates of return on the funds that they loan to the Spanish government, mostly because they aren’t so certain that they’ll get paid back. Although the demand for Spanish bonds was stronger than expected, higher borrowing costs would make it more expensive for the Spanish government to repay their debt later on. But how much trouble is Spain really in? Looking at its debt-to-GDP ratio which is around 60%, the grave which Spain dug for itself looks shallow compared to that of Greece which is seen to go over 140% by 2010. 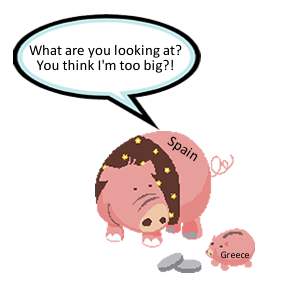 Ireland’s terrifying public debt, which is almost 95% of its GDP, also makes Spain’s debt look puny. The government also received thumbs-up signs from economic gurus when it increased its tax revenues by almost 11% through tax hikes. Plus, Spain’s economy looks pretty stable with its relatively upbeat performance. In fact, economic hotshots are betting that Spain will be able to meet its public deficit target of 9.3% by the end of 2010! Aside from that, Spanish banks also seem to have become less reliant on the ECB. Back in July, their borrowings amounted to 130 billion EUR but by October, they had cut it down to 68 billion EUR. Because of these figures, some find it silly to worry about Spain. After all, isn’t it the euro zone‘s fifth largest economy? Now, don’t get the wrong impression by thinking that everyone’s simply overreacting since Spain isn’t doing as badly as Greece and Ireland. Yes, it’s true that Spain is not as externally vulnerable as other debt-troubled euro zone nations, but investors are right to be worried. A closer look reveals that there are underlying weaknesses in Spain’s economy that may not be evident at first glance. The real estate bubble that took place in Spain was almost as large as that in Ireland, but even larger than the one in the U.S. Now, we all know how those bubbles eventually popped for Ireland and the U.S. and how house prices dropped sharply in both countries. But so far, home prices in Spain haven’t fallen as much, which suggests the worst is still to come. You also have to consider the fact that Spain never really showed signs of economic recovery. It has basically been muddling along ever since it was hit by recession. Need proof? Unemployment in Spain is the highest in the euro zone and is still hanging around at about 20%. Yep, that’s right, twenty freakin’ percent! Also, as I’ve mentioned in the past, Spain is quite exposed to the problems of other countries. For instance, Spanish banks have large holdings in Portuguese banks… and we all know how close Portugal is to receiving a bailout itself. Unfortunately, Spain’s economy is structured in a very rigid way. This presents a big obstacle as it prevents Spain from being flexible and making appropriate policy changes quickly. So what does this all mean for the euro zone? Well, the sheer size of Spain’s economy makes a bailout unlikely. Since bailing it out would require a huge sum of money, Spain will probably have to take a different path out of the woods. A restructuring of debt, perhaps? In any case, maybe the question we should be asking isn’t if Spain is too big to fail… Maybe we should be wondering if Spain is too big to be saved.